An ordinary man, raised as an orphan, and later worked as a merchant and shepherd, was capable of launching a spiritual revolution that would shape three continents and build an everlasting empire. His name was Muhammad. Born around 570 A.D in the sun blasted Arabian Peninsula, Muhammad had his first taste of life in the desert where tribes were locked in a state of ignorance, barbarism, superstitions, and constant war. By the time he was six years old, he lost both of his parents and was taken under the wing of his uncle, the chief of his clan Quraish, Abu Taleb. No matter how tragic it would be to grow up without one’s parents, Muhammad seemed very adaptable, and the issue had a deep impression of him as a young man as he developed a passion for the orphans, the poor, and the needy. At that time, the tribe was so significant that it constituted a key to everything: money, status, protection, honor, and dignity. During that time, each clan or tribe had its own deity and sets of totems signifying natural elements, most importantly, water, wind, fire and night. They were kept in Al- Kaaba which was itself surrounded by several idols. It was the only place where clans could not carry on their feuds. It is important to note that the Pre-Islamic Arabian civilization was an oral civilization. It regarded those who recited poetry with tremendous respect and admiration. The word, to the Arabs, had a mystical importance; it linked the tribe to its ancestors by their stories and celebrating long living values. At the age of twenty-five, Muhammad became a merchant whose talent had caught the attention of Khadija, a wealthy widow who happened to be an independent strong lady who had her own business. Muhammad and Khadijah enjoyed an amazing partnership as the former was very charismatic. He had his way with people and was capable of communicating with them. He was known as Al- Ameen, the trustworthy. People not only trusted him, but eventually, started referring to him in resolving their disputes. Muhammad was a very intelligent man. His bright mind saved lots of lives as people referred to him in their conflicts and dilemmas. Once, the Kaaba fell into disrepair, a quarrel broke out among the chiefs of clans as in who would have the honor of restoring the sacred black stone into its place. Muhammad proposed a solution that would please all parties. He suggested that the four chiefs share the weight of the stone by placing it on a cloak with each side being held by one leader. They invited Muhammad himself to replace the sacred stone expressing gratitude for his help. However, questions related to the origin of the universe and the afterlife haunted him. He set out on a religious. He would go up a hill near Mecca to meditate. What is peculiar is that, in the Pre-Islamic culture, religion was a mere set of superstitious beliefs. People chose their own gods, built idols, and bowed down for them. Muhammad found that he could not hold these beliefs as credible nor rational. He found the ultimate truth in Islam. The revelation was delivered in lyrical mode which surpassed the beauty of Arabic poetry. Muhammad now had to deliver the message that God is one. That was the beginning of the prophetic career of Muhammad. Though simple, the proclamation was radical. Muhammad explained to his people that the most important concept in Islam is the divine unity; the indivisible unity of God. In addition, it does not only mean that God is one, but it also means thinking about one thing: God and disregard all other things, such as possession, status, power. These are all intellectual idols. The implications of this message was rather astounding: One God means one people, and one people means that they are all equal. This message of social justice proposed that all humans were entitled to the same rights and privileges. The social reforms that he brought were staggering: he forbade exploitation of the vulnerable, protected the poor by establishing regular charity and alms, upheld equality and crippled the arrogant class and the race-based system. Most importantly, Muhammad as the first social activist in history was an advocate of women. He started by stopping the habit of burying girls alive, which was very common at that time, since girls were considered of a lower status than boys. In addition, Islam granted women divinely sanctioned inheritance, property, social and marriage rights, including the right to reject the terms of a proposal and to initiate divorce. Beginning from the time of Muhammad's marriage to his first wife Khadijah, women played an important role in his religious career. 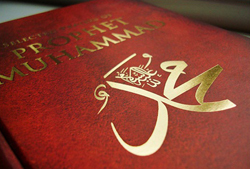 According to Muslim sources, Khadijah was the first person Muhammad spoke to about his initial experience of revelation. She consoled him and became the first convert to Islam. She remained a confidant and source of support throughout their entire marriage. Muhammad proposed a highly accurate social system. It preserved the rights of all individuals sustaining their welfare in an attempt to put an end to crime. In addition, to being a social activist and a judge, he was also a military leader. He was truly a great general: in one decade, he fought eight major battles, led eighteen raids, and planned another thirty-eight military operations where others were in command but operating under his orders and strategic direction. Wounded twice, he also twice experienced having his positions overrun by superior forces before he managed to turn the tables on his enemies and rally his men to victory. More than a great field general and tactician, he was also a military theorist, organizational reformer, strategic thinker, operational-level combat commander, political-military leader, heroic soldier, and revolutionary. The inventor of insurgency warfare and history's first successful practitioner, Muhammad had no military training before he commanded an army in the field. Thus, the religion that Muhammad brought was not a mere set of rules, but a beautiful way of life. It is the one and only religion with a universal appeal. It is acknowledged as humanity’s grandest achievement that has shaped cultures across the globe.